Let me first say that photographers (myself included) tend to overlook safety too frequently when attempting to capture the perfect shots. Lightning is extremely dangerous and strong caution is advised when attempting to photograph it. That said: Summer is the season for lightning. A couple of days ago, my wife came in from walking the dog at nearly midnight and said that I had to go out and see the lightning in the distance. A quick check of the weather radar showed that a strong thunderstorm was going to graze us and even though my body said "No! It's time for bed! ", my brain knew that this was a great opportunity and that the potential photos, if realized, would last far longer than my tiredness. I quickly assessed the focal length needs and mounted a Canon EF 24-70mm f/2.8L II USM Lens on a Canon EOS 5Ds R. Lightning strikes tend to be random in location and, with the extreme resolution of the 5Ds R, I could afford to shoot with a wider focal length and crop into the frame for the shorter and more-distant lightning bolts. Lightning bolts also vary greatly in brightness and the f/2.8 lens gave me plenty of latitude for exposure settings. I grabbed a tripod, remote release and a tiny flashlight. I went out the door and spent the next hour capturing lightning strikes. Note that rain protection for both you and the gear is a very good idea as rain typically accompanies thunderstorms. In this case, my shirt became the gear protection and I simply got wet. When it is very dark out, lightning photography is not too difficult. Frame the scene in the direction of the storm (consider incorporating some foreground) with a level camera. Turn off image stabilization (if available) and switch to manual focus. Establishing accurate manual focus in the dark can be challenging, but a street light, a light on a distant tower or even a star (if visible) can work. Attach the remote switch (needs to be able to lock the shutter open) to the camera and set the camera's mode to "B" (Bulb). The shutter speed will be established by the duration of the remote release press. With the dark sky contributing very little light to the exposure, the image brightness will be determined by the lightning and its illumination of the clouds in combination with the selected ISO and aperture settings. 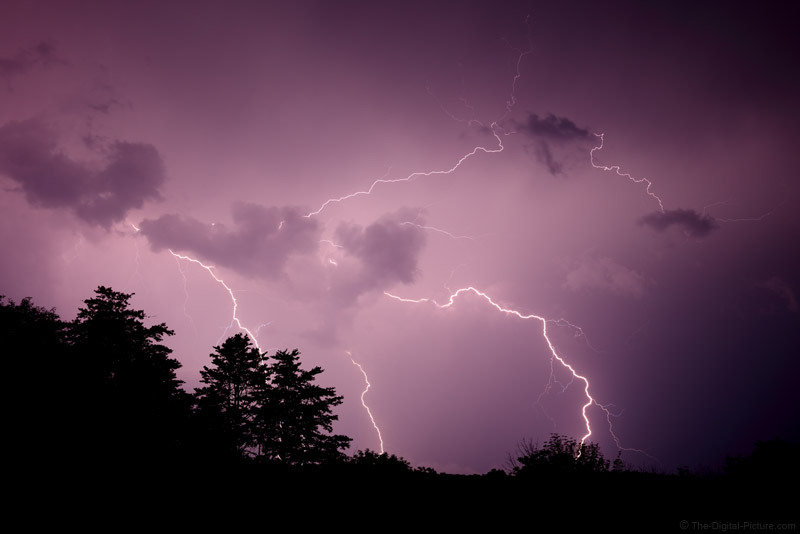 Lightning bolts are very bright, but because of the varying distance and intensity of the light output, some trial and error may be necessary to dial in the most-optimal settings. I'll throw out a starter setting of f/4 and ISO 400. You may decide that turning off the camera's long exposure noise reduction is advisable as dark frame capture is time consuming. Once the camera is setup, open the shutter using the remote release and wait for lightning to strike. After a strike, release the shutter and immediately open it again. Bryan's Law of Lightning Photography: The best lightning bolts are guaranteed to occur in the brief period of time that the shutter is closed between exposures. You may find that you want to start a new photo after a period of inactivity to reduce long exposure noise in the images. Leaving the shutter open for multiple strikes is an option, though a risk is that parts of the image, generally clouds near an area of recurring lightning activity, become overexposed. You may find it more optimal to combine specific images later during post processing. I captured more lightning strikes in this 1 hour storm than I have in any storm I previously photographed. The results were definitely worth an hour of lost sleep. This image, my favorite of the take, is a single exposure practically straight out of the camera (slight cropping and Picture Style change). While the nighttime lightning photography technique is relatively easy, daytime lightning photography is much more challenging. Daylight lightning photography procedures are not dissimilar from normal daylight photography, but the problem is that relatively short exposures are required to achieve proper image brightness and short exposures are hard to time with a lightning strike. To catch a bolt of lightning in daylight requires FAST reflexes (or better, a lightning trigger) and a camera with a short shutter lag. Give lightning photography a try – the results will be ... "striking."